With horn soloist Eric Ruske, pictured at right, Friday, 8 p.m. at the Opera House. Tickets are $15 to $34, through the symphony ticket office (624-1200) or TicketsWest outlets (325-SEAT, 800-325-SEAT, www.ticketswest.com). Eric Ruske wanted to play the trumpet. But because of the alphabet, he became a French horn player instead. “Like a lot of kids, I started in the public school music program when I was in the fourth grade,” Ruske says. “And like a lot of boys, I really wanted to play the trumpet. 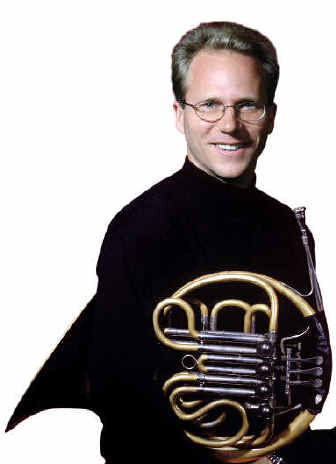 In the years since he was sent home with a French horn, Ruske has established an international reputation as one of the outstanding virtuosos on that demanding instrument. Ruske was born in LaGrange, Ill., a suburb of Chicago. “Neither of my parents were musicians,” he says. “My father was an electrical engineer and my mother was a second-grade teacher – a great combination of right-brain and left-brain. Ruske’s sister studied cello for a while, he says, “but in the battleground that is volume between two competing instruments, I won. I remember quite a few slammed doors at home when we were both trying to practice. In high school Ruske studied with Eugene Chausow, and he continued his studies at Northwestern University with Dale Clevenger, principal horn of the Chicago Symphony. Ruske turned out to be much more than “half decent,” critics and musicians agree. In 1985, then only 20, he was appointed associate principal horn in the Cleveland Orchestra. Subsequently he won prizes in a series of international competitions in the United States and Europe. “I loved playing in the Cleveland Orchestra; it was a great experience for me,” Ruske says. “It’s a world-class orchestra with some really sweet people in it who helped me a lot. But I had decided that there were other things I wanted to do. Now Ruske teaches at Boston University, gives an annual horn seminar at Tanglewood, performs as a soloist and in chamber music, and makes recordings for the Albany label. He has just recorded a soon-to-be-released CD containing both concertos by Richard Strauss as well as one by Strauss’ horn-playing father, Franz Strauss, and the Horn Concerto by Reinhold Gliere. “For me the two really great pieces of music centering around the French horn are Strauss’ Second Concerto and Britten’s Serenade for Tenor, Horn and Orchestra,” Ruske says. “Both are total pieces of orchestral chamber music, simply very great music. In Friday’s concert, Ruske will couple the Strauss concerto with Mozart’s Horn Concerto No. 1. “Even though I have recorded all the Mozart concertos, I don’t play this one very often,” he says. “It has some wonderful tunes – it is Mozart, after all – and a really fun rondo for a finale. But it only has two movements instead of the usual three, and they are very short. Ruske will join host Verne Windham – former principal horn of the Spokane Symphony, now program director for KPBX-FM public radio (91.1) – for Classical Chats, the symphony’s pre-performance conversation, today at 12:15 p.m. in the council chambers at Spokane City Hall. The 30-minute program will be televised on City Channel 5. Preu will discuss the music on Friday’s concert as a part of the Gladys Brooks Pre-Concert Talks series in the Opera House auditorium at 7 p.m.